From kindergarten and first grade to second grade and beyond, these language workbooks are the perfect supplement to the materials you’re already using. Correlated to state and national standards, this workbook series helps to improve grammar skills and reading comprehension by providing daily practice in punctuation, parts of speech, spelling, and more. The book includes data-driven assessment tips as well as digital resources, tools and PDFs – you’ll have everything you need to help your student improve his/her language skills in a matter of 180 days! Inside the fun yet challenging workbook you’ll find 180 quick, diagnostic-based activities – yes that’s one for each day for 180 days - the workbook is a great jumping off point for daily writing practice during class. It also includes data-driven assessment tips and digital resources, such as pdfs of activity sheets, making lesson planning easier. Who should use this workbook? 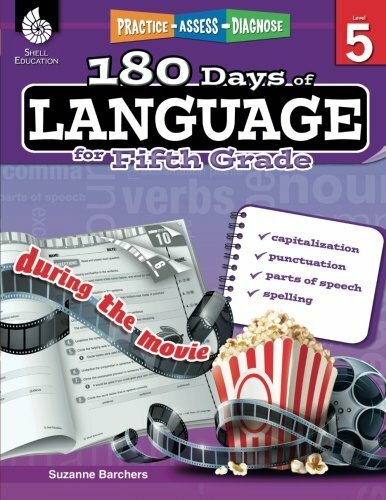 It’s perfect for the student who needs to spend a little extra time working on their language skills outside of school. 180 Days of Language provides thematic units and lesson plans that offer guidance and support for each day’s activities. This comprehensive resource builds essential communication and interaction skills through grammar, punctuation, and language. Help your students become fantastic communicators so they can thrive throughout their school years and beyond. BUILD GRAMMAR SKILLS - Daily activities provide practice with punctuation, capitalization, and spelling. Increase writing and oral reading skills with this 5th grade workbook. DAILY PRACTICE - Fun and engaging daily practice activities build understanding and retention. Practice makes perfect! ALIGNS TO STANDARDS - Every practice page provides questions tied to a language standard (both state and national standards). Regular practice allows students to increase skills and demonstrate understanding. EASY-TO-USE FORMAT - These fun and quick activity pages are great for use at home or in the classroom. Increase grammar and reading comprehension skills and confidence with this easy-to-use workbook! CREATED BY TEACHERS - Shell Education develops innovative and imaginative educational materials for students worldwide. Everything we do is created by teachers for teachers and students to make teaching more effective and learning more fun. View More In Study Guides & Workbooks. If you have any questions about this product by Shell Education, contact us by completing and submitting the form below. If you are looking for a specif part number, please include it with your message.